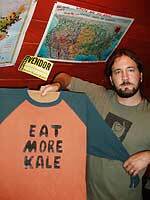 Muller-Moore prints the “eat more kale” T-shirts in his studio/garage and sells them world wide. As his business grew, he filed an application to trademark the “eat more kale” phrase with the U.S. Patent and Trademark Office. His application is pending. Muller-Moore has enlisted help of a Montpelier lawyer and the University of New Hampshire School of Law’s Intellectual Property and Transaction Clinic. Professor Oliver Goodenough, of the Vermont Law School, whose expertise includes intellectual property and copyright law, said there was little likelihood consumers would confuse kale with chicken. Although Muller-Moore is determined to fight big chickin, Chick-fil-A, in a cease-and-desist letter, listed 30 examples of others who tried to co-opt the “eat more” phrase and later decided to withdraw. Chick-fil-A is insisting that Muller-Moore stop using the “eat more kale” phrase and turn over his website, eatmorekale.com, to Chick-fil-A. Apart from the atrocious spelling, I’ve always considered the “eat mor chickin” campaign a little strange. It’s a campaign that promotes the consumption of chicken in general and not Chick-fil-A chicken in particular. Other chicken franchises, such as KFC and Church’s, also benefit from the campaign. 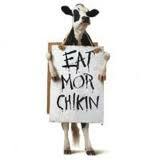 The “eat mor chickin” advertisements were suspended during the mad cow disease scare of late 2003/early 2004. Muller-Moore’s chickens have come home to roost. Chick-fil-A has company lawyers and plenty of capital to pursue this issue till the cows come home. H/T: AP, CSM, The Consumerist. just to clarify, I was not saying Chick-filet-A should prevail, just that it is normal and even mandatory for them to fight each case like this even if they don’t really feel there is a violation. I don’t get this at all; I hope Eat More Kale prevails! I was thinking of posting Weird Al’s parody “Eat It” but you will never forgive me for that ear worm; so I could go with the Hershey commercial for “Eat More” candy bars; which makes me think of Willy Wonka’s “I Eat More”; so last but not least here is Oil On Canvas with “Eat More Fruit” Enjoy! KC, while you are signing petitions and galloping around on your high horse, don’t forget to take the time to go vote for the Turley Blog on the ABA web site. So do I and too may others to enumerate. That’s the wages of being around for awhile and also the reason they pay people big bucks to craft them. for my taste and in my experience self righteousness goes hand in hand with being self centered. As in your excrement is odorless. This post cost me a hundred dollars this morning. Because as I told my children after I read your post my high horse came running in and I just had to get on it and ride. I forwarded it, the post, on to family and friends, signed the petition and mentioned to the maker of the kale shirts that if Chik-fil-a wanted to improve their market standing they would do better to treat their employees better. My daughter worked for them years ago and they by far are the worst company she ever worked for. I don’t like Kale and don’t wear shirts with slogans so didn’t get myself a shirt, but my high horse sure got a lot of exercise this morning. I am unsure how the hell you can confuse eat more kale with the other slogan….However…one is good for you and the other is not…I can count on one hand how many times I have eaten at chik fil…. i guess uncle jed is gonna have to burn his “eat more possum” t-shirts. None of the the Lexis-Luxus-Lexus trio sued each other. And I’m not a fan of the restaurant or the vegetable, nor do I see a resemblance of style or even font. I do feed attorneys. They’re friends and relatives, and they low off my hog. The scary thing is I remember too many of those Pepsi slogans! I agree with Rafflaw and I think the intellectual property battle has tipped over into rampant corporatism. I can see “eat more Kale” as satirizing Chic-Fil-A and that should be allowable in the marketplace as free speech. There is nothing uniquely intellectual about “eat mor chickin” except that the company has designed an add campaign around it. If we really are in favor of a competitive marketplace than satirizing competitors slogans should be fair game. 1981-1982: Pepsi’s Got Your Taste For Life! How many of them should be barred from others usage? I think this is one more example of corporations abusing the trademark process. How can any corporation claim that the the two english language words, Eat and More be owned by them when they are used together? Kale and chicken are similar enough to cause any confusion and I will second Tony C.’s comment about the additional reason that the use by the Kale author does not conflict with Chick-Fil-a’s use. Speaking about voting, I hope all our commenters take the time and vote here. I would vote for kale too but I would be a biased juror because of chick fil a’s contributions to anti-gay groups. I see Sharon’s point and agree that the battle should be joined but Tony C’s second argument resounds with me and as a juror I would vote in favor of kale specifically because the humorously selfish redirection component was not present. surely by now you have seen dozens and even dozens of dozens of similar cases. The simple truth is that companies *have* to fight such trademark infringements even in cases where there is no confusion. Failure to do so could end up with them being unable to fight it even in cases where it is a clear violation. And after all, the only reason “eat more kale” works is it is a play on Chik-fil-A’s slogan. As a marketer, I think Chick-Fil-A has a valid case; their catch-phrase is diluted to the point of genericism by copycats using the prefix for advertising. Just like the original “Got Milk?” campaign was diluted by thousands of “Got X?” copycats. In the “Got Milk?” campaign, it is fair to assume these copycats would not have used this construction (Got X?) if the “Got Milk?” campaign had not popularized the construction in the first place; and that took them time and money, and whatever traction or recognition this construction has with the public rightfully belongs to them. A similar but weaker argument for dilution can be made for the construction “Eat More X.” If I were defending the use, I would point out that Chick-Fil-A’s construction is specifically designed as a self-preservation humor by cows, which are also eaten. The cows are depicted making signs, spelling badly, and in general running a campaign to have people eat less beef and more chicken for their own selfish reasons. The “Eat More Kale” slogan does not possess that humorously selfish redirection component; they do not pretend to pit Lettuce against Kale. I’m one, too, ie a lawyer (not a chikin). Chick-fil-A assumes then that consumers cannot tell the difference between a head of kale and a chicken. Now I’m not the sharpest knife in the drawer and even under the influence of the premium vodkas that I find so delectable, I can state with 100% certainty that I have never made that mistake and find it highly unlikely to occur.